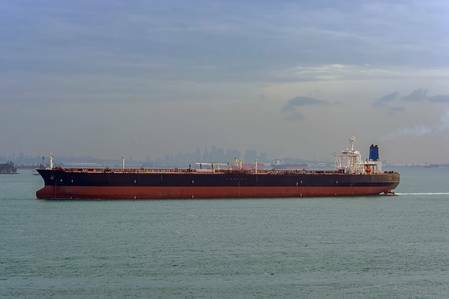 The development that saw no U.S. seaborne exports of crude oil to China in August has continued into September, according to BIMCO. This is despite crude oil not being a part of the ‘official trade war’. “The trade war between the U.S. and China is now impacting trade in both tariffed and some un-tariffed goods with both countries looking elsewhere for alternative buyers and sellers,” said Peter Sand, BIMCO’s Chief Shipping Analyst. “Ton mile demand generated by total U.S. crude oil exports has risen 17 percent from August to September, but is down 4.8 percent from the record high in July. In 2017, Chinese imports accounted for 23 percent of total U.S. crude oil exports. In 2018 that number was 22 percent during the first seven month, but has dropped to 0 percent in August and September. 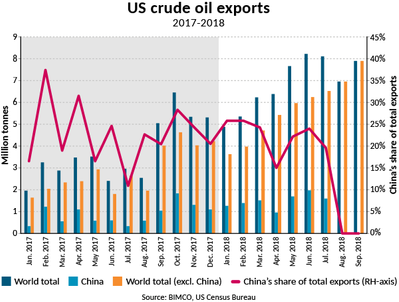 For the seventh month in a row total U.S. crude oil exports, excluding china, hit a new all-time high reaching 7.9 million metric tons in September, BIMCO said. South Korea has become the largest long-distance importer of U.S. crude oil at 1.1 million metric tons in September, its highest level ever. Similarly, the next top three overseas importers of U.S. crude oil, namely the U.K., Taiwan (both at 0.94 million metric tons) and the Netherlands (0.74 million metric tons) all imported more in September than ever before. Exports to Asia jumped in June and July, from a 43 percent share of total exports since the start of 2017 to reach a 56 percent share. That share was down to 46 percent in August, but climbed back to 51 percent in September. The two other major importing regions are Europe (33 percent) and North and Central America (13 percent), while South America (2 percent), the Caribbean (1 percent) make up the rest - September share of exports in brackets.